EXPERIENCE: Our shop opened as a tiny hole with one counter run by skateboarders in 1976, so we have a wealth of knowledge about not only the skateboards, but the skateboard industry as well. We ship all over the world. We take phone orders, online orders and faxed in orders. We offer phone help and an online bulletin board for FAQ's. We also do custom built skateboards and publish an online sizing tips page. The men and women working at Skates on Haight have been skating and selling skateboards for 33 years. Our skater employees know how our products perform because we use them, not just read about them in manufacturers' brochures. We sell what we skate. We also have a REAL walk-in store at 1818 Haight Street, San Francisco, CA. INVENTORY: We have a wide variety of products and constantly keep on top of the newest products being manufactured. Sometimes we pre-sell items because they are so hot that we want you to be the first ones to have them. We carry mainstream and eclectic skateboarding equipment. Check out the entire skateboard catalog now! NEW PRODUCTS: We carry the newest and most recent products available in the skate industry, including hard-to-find and old school products, and special edition items. Our great relationships with manufacturers like Flip, Shorty's, Hookups, Spitfire, Sector 9, Powell, Vision, Birdhouse, Zero, Comet, Surf One and many others allow us to carry all their newest products. Any items that we buy in bulk can usually put be put on Super-Sale and you benefit! PARTS: We have deep piles of parts and gear for your skateboards. Bushings, risers, kingpins, hardware, tools, spacers and other items to maintain your board. 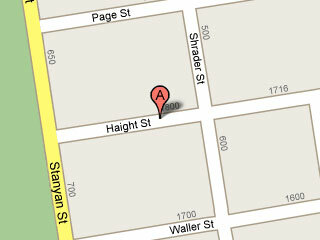 Call us 1.415.752.8375 or visit us at 1818 Haight Street San Francisco. FAST SHIPPING: We ship out every order within 24 hours of when it was purchased (except special orders and backordered items). Our shipping is quick, accurate and processed carefully. We have automated tracking to ensure that your package is on the way. Please refer to the "Shipping Policies" inside the HELP DESK to learn how we calculate shipping. All Domestic and International shipping rates are calculated internally and automatically. Emailing us for quotes only gives you an approximation. Please use the shopping cart to get real and accurate rates. Pick the skate product (s) you want on Skatesonhaight.com and add them to your shopping cart. Click the button, "Proceed to Checkout". A detailed order page will come up, itemizing your complete order. Select the drop-down menu under shipping to view the shipping rates and shipping methods available. Select one. USPS is dropped off everyday at 12:00PM PST. UPS picks up everyday at 4:30PM PST. If you are shipping internationally please be sure to check "More Carriers" under the shipping choices. The customer is responsible for all Duties, Taxes and/or VAT (Value Added Tax) imposed by their respective countries. These taxes are not included in the total invoice from Skatesonhaight.com. We only charge for shipping from United States to your respective country. *Skatesonhaight.com DOES NOT profit monetarily nor reap any other benefits from the taxes imposed on the customer by their respective government. RETURNS AND REFUNDS: You may return any item that is unused for 30 days after you receive it, with the exception of custom completes, vinyl records and gripped skateboard decks. We may choose to buy these items back from you at 50 percent of their purchase price if you like. Please call or email for an RMA number for any item you wish to return. VINYL RETURNS: All vinyl sales are final. Warped records CANNOT BE RETURNED for any reason. Many records come with a slight warp due to imperfect presses and distributor storage. This problem is easy to correct. Just place your thumbs on the center of the record and flex the edges in the opposite direction of the warp. Rotate, repeat, test on the turntable. Do this a couple times whenever you play the record and it should fix itself. Used items are NOT Returnable, Exchangeable nor Refundable. No exceptions. The skates/shoes/items you receive in the mail are brand new and in unused condition. We strongly recommend that you try them on indoors on smooth or carpeted surface to ensure proper fit before using them at all. This will preserve the condition of the items should you choose to return them. In other words, do not attempt to test skates or items by skating around the block or wearing shoes outside. We do not differentiate between slightly used, well used or very used. Any skate/shoe/item which comes back to us in a condition that cannot be resold as new are considered used. All our items are guaranteed directly from our manufacturers. In the event of a defective item we will be happy to assist you with the warrantee process but hold no direct liability for the cost or shipping of the item itself. All defects are handled on a individual basis and we may either choose to inspect the item ourselves or have the manufacturer inspect the item for replacement assessment.